When identifying the presence of secretive wildlife – beasts that are difficult to spot when they’re out and about – successful poo spotting and identification is vital. If a tad on the unpleasant… or even obsessive… side. So if you are a sensitive soul – or about to tuck into your poached eggs on toast – you might want to skip this post and I promise to find a more tasteful topic tomorrow! While trying to identify our frog predator down at the pond 10 days ago, we came across this “deposit”. Difficult to know what left it but it’s definitely an insect eater – all the bits of wing case and body indicates that it has feasted on (or made do with) beetles. It could be related to the deconstructed frogs, the remains of whom I photographed and wrote about a few days ago… but now, with my next bit of local wildlife news in mind (follows in a paragraph or two) as I type this I’m actually wondering whether this isn’t “poo” at all but is the remains of a bird pellet – indigestible food regurgitated by, say, a buzzard. It could have been out in the rain for a day or two before I spotted it so the pellet would have begun to disintegrate. I’m tending towards this opinion but will ask Chris Luck of PlanetePassion what he thinks. 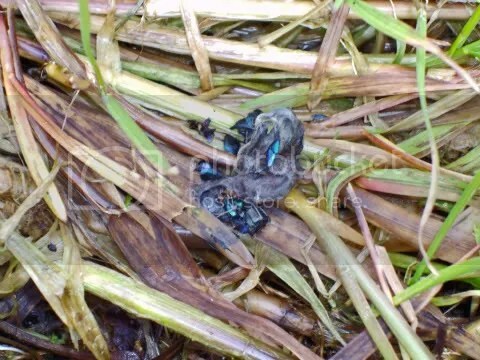 If this is a pellet rather than poo, that rather makes sense as I have seen buzzards down at the pond picking off inattentive frogs and – particularly in cold weather when small rodents are not particularly active – buzzards happily eat ground insects and worms. I didn’t know until recently that most birds will regurgitate the remains of food that can’t be digested. I’ve always associated regurgitation of pellets solely with birds of prey who take in rodents and larger furred or feathered prey – rabbits or pigeons, for example – and eject the compacted waste from their gullet. But apparently regurgitation in some form is an action that all birds are capable of; it is simply more visible in larger birds. However, we know that the next photo shows a pellet – found on our palier at the top of the steps outside the front door. There are several perching opportunities so presumably a bird sat on the railings and ejected the remains of the previous evenings meals. Owl pellet - note the little bones and particularly the rodent teeth at the top of the pellet. The pellet was about 4cms, top to bottom. 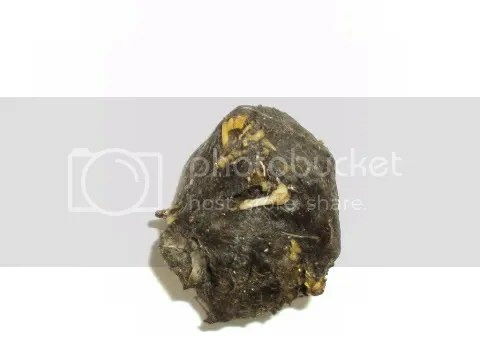 Another fascinating thing about regurgitated pellets – apart from the fact that soaking it and pulling it apart will tell you (via bones and particularly skulls and jaw bones) what small animals have been consumed, pellets are pretty much specific to the type of bird. Accordingly, comparing photos of pellets on the internet, the pellet in the photo is from a Barn Owl (Tyto alba). As the waste is compacted in the bird’s gizzard, it takes on the shape of the gizzard hence the shapes differ according to whether the pellet is from the gizzard of a Barn owl or, say, a Tawny Owl. And this deduction does fit the circumstances as we regularly hear barn owls quartering the fields in the late dusk making their screeching, hissing noises. But we’re rarely lucky enough to see them.